Kamen Rider (Masked Rider) is a weekly science fiction story created by Japanese manga artist Shotaro Ishinomori. It debuted as a tokusatsu television series on April 3, 1971 and ran until February 10, 1973, airing on the Mainichi Broadcasting System and NET TV (now TV Asahi). A manga adaptation was also featured in Shōnen Magazine around the same period. The series has spawned many sequels and evolved into a franchise. The cultural impact of the series in Japan resulted in Akimasa Nakamura naming two minor planets in honor of the series: 12408 Fujioka, after actor Hiroshi Fujioka, known for his portrayal of Takeshi Hongo/Kamen Rider #1, and 12796 Kamenrider, after the series itself. Download the PDF file here and make your own Kamen Rider toy! Tell us what toys you like to see next by visiting our Facebook page. Two Domo figures contributed by our long-time reader Richard Young. 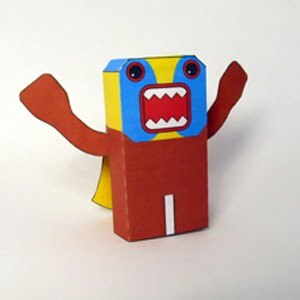 Download the PDF to make your own Domo! 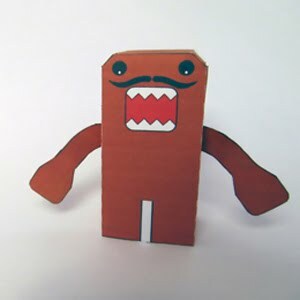 Moustached Domo and Lucha Domo. 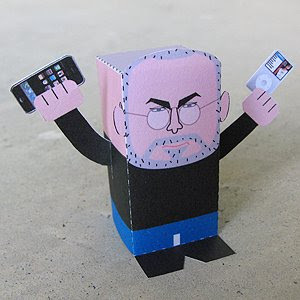 Download the free PDF file here and make your own Steve Jobs toy! You can also get our blank template from our Facebook group and design your own toys! Pee-wee Herman is a comic fictional character created and portrayed by American comedian Paul Reubens. He is best known for his two television series and film series during the 1980s. The childlike Pee-wee Herman character developed as a stage act that quickly led to an HBO special in 1981. As the stage performance gained further popularity, Reubens took the character to motion picture with Pee-wee's Big Adventure in 1985, toning down the adult innuendo for the appeal of children. This paved the way for Pee-wee's Playhouse, an Emmy Award winning children's series that ran on CBS from 1986-1991. Another film, Big Top Pee-wee, was released in 1988. Download the PDF file here and make your own Pee-wee! Tell us what toys you like to see next by visiting our Facebook Fan page.